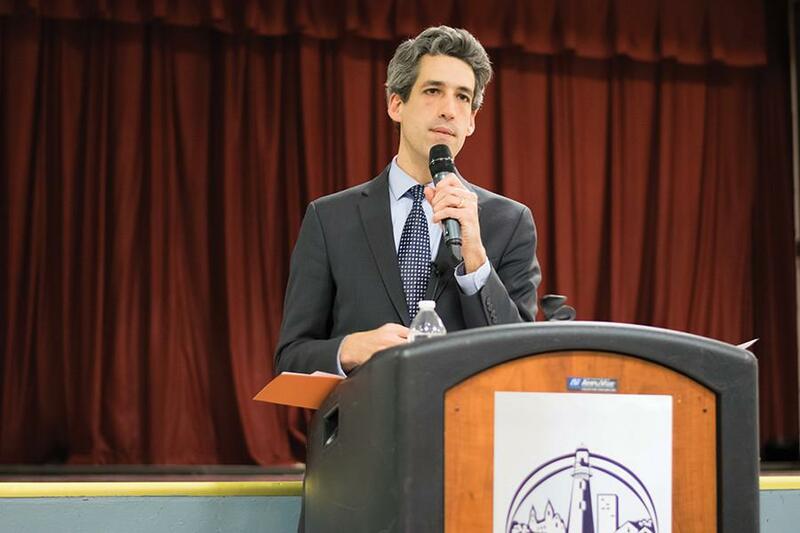 State Sen. Daniel Biss (D-Evanston) speaks at a town hall in January. Biss introduced a bill which aims to tackle Illinois student debt. A new bill aiming to tackle Illinois student debt cleared its first major hurdle after being passed by the Financial Institutions Committee on March 15. The bill, introduced by State Sen. Daniel Biss (D-Evanston), who is running for governor, proposes a Student Bill of Rights to guarantee reliable information to borrowers and enforce accountability on student loan servicers. Student loan servicing companies are the middlemen between the borrower and the lender, providing information to borrowers and processing payments on the loans. The bill is part of a broader push in Illinois to help ease the debt burden on students. Biss co-drafted the bill with Illinois Attorney General Lisa Madigan, who filed a lawsuit in January against Navient Solutions and Sallie Mae, two of the largest student loan providers in the United States. Madigan claimed Navient repeatedly led student loan borrowers into more expensive repayment options. The Consumer Financial Protection Bureau is also suing Navient for allegedly cheating borrowers out of their repayment rights. The bill, which was introduced Feb. 9, places new regulations on lenders and servicers, obligating them to be more transparent with borrowers than was previously required. In addition, the bill creates a new position in the attorney general’s office to handle complaints about student loan malpractice, attempts to expedite the processing of payments and implements heightened licensing requirements for Illinois lenders, according to Madigan’s March 15 news release. In response to the CFPB’s lawsuit, Navient denied wrongdoing. “Navient has a well-established, superior track-record of helping student loan borrowers succeed in repayment,” company spokesperson Patricia Nash Christel said in a news release. Biss discussed the urgency of his new bill in a March 15 news release. “At a time when a quarter of student loan borrowers are behind in their payments, we need to make sure borrowers understand their rights and have access to resources that will prevent them from defaulting on their loans,” Biss said in the release.